Episode 9 of Inside BU Hockey features Bernie Corbett’s interviews with Head Coach David Quinn, sophomore wing Mike Moran who scored his second goal of the year on Saturday vs. Cornell, and former Terrier standout forward and Merrimack Head Coach Ron Anderson (photo). Anderson played two varsity seasons and was a key offensive cog for BU’s back-to-back national champions in 1971 and 1972, scoring 39 goals in 62 games—including two goals in BU’s 4-0 shutout of Cornell in the ’72 title game. 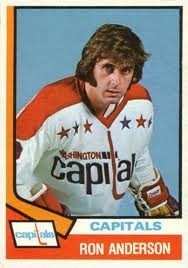 After several AHL seasons, Anderson played 28 games with the Capitals, scoring nine goals and seven assists. He became head coach of the Warriors in 1983-84 and continued through the 1997-98 season. More recently he’s been an NHL scout and currently is Director of Player Recruitment for the Stanley Cup Champion Blackhawks. Former Terrier and current Dallas Star Alex Chiasson is featured this week on USHL Alumni Voices. The Quebec native discusses his season with the Des Moines Buccaneers and ensuing career at BU. 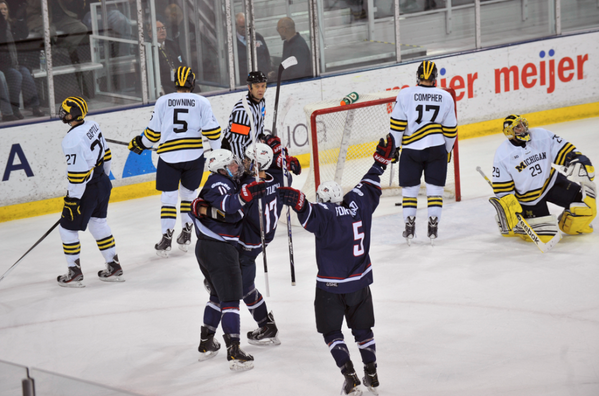 2014 recruit Jack Eichel scored his team-best 18th goal (#11 below) and extended his scoring streak to 11 games as the NTDP U18s rallied to defeat #3 Michigan, 5-4 in overtime, at Yost Arena. Eichel also screened the Wolverine goalie on the game-winner. In that 11-game span, the 6-1 center, just named to the U.S. Junior National Team pre-camp roster, has 12 goals and 15 assists.